Excuse after excuse kept popping up until I finally realized tomorrow would never come unless I re-organized my time, stated my goal out loud (to real, live people) and set the date. I think this goal setting system might work well for me! My heart is all ooey gooey with the out pouring of LOVE and support, near and far, from each and every one of you magnificent people. I simply cannot put into words my gratitude for your open arms. Thank you. And to really show how much this means to me, I thought I’d share a little treat that I think you might just fall in love with. The kiddos and I made these for our quiet New Year’s Eve celebration and then I played with them again for a dear friend’s baby shower because they are just too cute and tasty! A quick word about ingredients. I will always try and share the brands I use. I’ve tested a variety of brands and will play with more, but I cannot convey how different the recipes taste with quality ingredients. And by different I mean better. I use organic whenever possible, pink sea salt (Real Salt), raw honey, Grade A Maple Syrup, and so on and so forth. These ingredients can be found at some grocery stores and most natural food stores like Whole Foods. However, Costco has joined the world of natural living and offers a great selection of high quality, bulk selections of coconut oil and almond flour! I could write an entire post about ingredients. Hmmm….back to your special treat! Preheat your oven to 350F. Line your cookie sheet with parchment paper. Melt your coconut oil on your stove top. This only takes a sec, so keep a watchful eye because if the oil is too hot when adding it to your dry mix, it will burn the flour and burnt flour is not the taste we’re going for. Trust me. Mix the almond flour, arrowroot starch, baking powder, and salt together. Add your melted coconut oil, maple syrup, and vanilla and stir until you have a creamy cookie dough. Scoop a heaping tablespoon of dough into your palm and roll into a ball. Gently press the dough down onto the cookie sheet to slightly flatten. Do this with the rest of your dough then go back and insert your thumb into the center of each cookie to make a basin for your jam. During the ball rolling and laying, the kids and I know we must taste test the dough (no eggs!) to ensure a perfect balance of sweet and salty. Go ahead. Just leave a few to bake or quickly whip up another batch if you look down and your mixing bowl is empty. 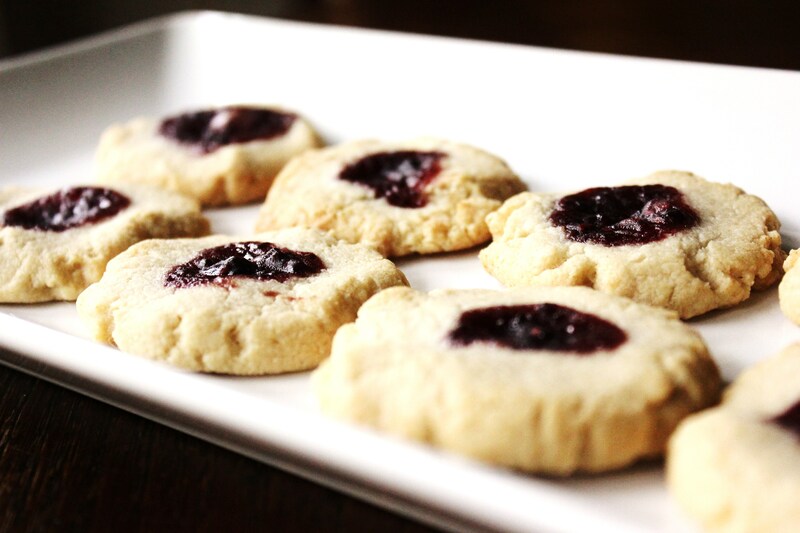 Spoon a dollop of jam into the thumbprint hole of each cookie. Bake for 13-15 minutes. Oven times vary so keep an eye out for a beautiful golden color and you’ll know they’re ready. The warmer the golden color, the more flavor and better set the cookie! Let cool and enjoy – if you can wait that long! Again, my most heartfelt thanks for the beautiful kick off! Joseph said these are yummy. Need to make a trip to the store. I will let you know how mine turn out. My new favorite cookie! I’m serious. Very. Yum!!!!!!!! 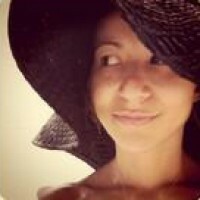 I just discovered your blog via Pinterest and wanted to say how beautiful it is! It’s such an encouragement to have a peak into the life of someone that has similar values- from food/health to faith, and etc. 🙂 congrats on your recent blog kick off! Thank you so much for your encouraging comments, Taylor! They warm my heart 🙂 Have a blessed weekend! Thank you, Taylor, for the sweet encouragement. It means the world to me! I was finding the need over the years for that complete circle of food and faith- happy bellies, happy souls:) I’m super excited to share what Life has in store! Lucas made these last night—-without the fun fruity dollop. Absolutely delicious. Thank you!